Anne Arundel Community College in partnership with Arundel High School to recognize attendees for participating in the Adventure held in the Center for Applied Learning and Technology at Anne Arundel Community College on August 28, 2017. The badge is issued to those who demonstrate a understanding of the value of Continuing Education Certificates and Digital Badging as workforce credentials. Attendee has attended the Adventure topic Continuing Education Certificates held at Anne Arundel Community College. 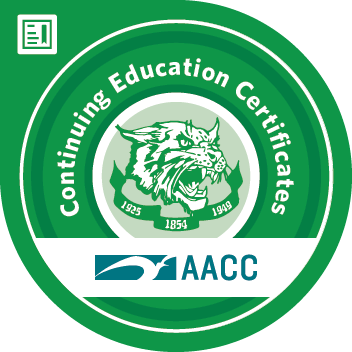 Continuing Education Certificates - Demonstrate an understanding of how Continuing Education Certificates provide students with the opportunity to build in-demand skills to meet the needs of the local business and industry. Digital Credentials - Demonstrate an understanding of Digital Badges and the value that lies in the ability to assemble evidence of different granularity and from different sources - diverse ways to gather proof of competence. Collaboration - Anne Arundel Community College working with Arundel High School will provide resources for students and parents to focus on Continuing Education's professional certificate programs that can help students reach their goals in a fairly short period of time and with affordable tuition. The courses are taught by faculty members with extensive experience in their fields and a commitment to helping students be successful and gainfully employed.